east van baby: Mikkel is 2! How time flies! Mikkel is 2! How time flies! aw my darling little girl is 2 years old today! total second child syndrome though as i have absolutely ZERO plans (sorry girl)! actually, ill give myself some credit- plans are on the other tab of my browser, nothing finalized though except a cake was bought (1 point)! at 2, Mikkel wakes up in the morning quietly walking down the hall wondering if anyone is awake (i wake up at 7 to be sure I'm around to receive her). 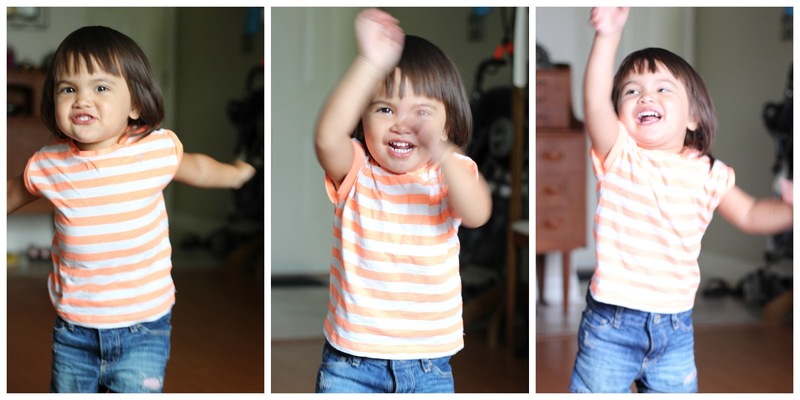 Once she sees me (with the biggest smile on her face), she stands in one spot giggling and swinging her arms. she then runs to me to which i pick her up and throw her up in the air- which she kinda hates, but I've downsized it a notch by not actually letting go of her. Her morning job is to feed the cat, and she 9/10 times will actually tell me to "feed Moe-Moe"- so regimented, like mother like daughter ha! she then sits on the couch where she wants to watch a "movie," which in her case is Beauty and the Beast (film version). Just recently though, she's been saying "no like movie, no like beast" whereas prior it was this movie in its entirety almost twice a day, once for sure. Sometime in the last month, she's been rejecting her go-to breakfast which was maple/brown sugar oatmeal- we honestly had a good year of it being her breakfast every single day! Now, she doesn't eat breakfast until later (1-2hours after waking up) which actually works out because she's hungry and will eat almost anything except the Oatmeal. For lunch, she's a light eater; she's definitely no longer digging the mojo fries and chicken tenders as per history. She'll nibble on random things from the bag like a carrot, apples, Kettle Chips (new york cheddar! ), cheerios, chips shaped like fries, oranges...whatever i have around. For dinner, because she's a light lunch eater, she usually eats more...even more so when rice is involved. Dinner is often the time when she'll have her most meat and veg intake. After baths, it's homemade popsicles to finish the day off. at 2, Mikkel loves her brother the most out of all her toys. He wakes up the last (most of the time) in our household and when he calls us from his room, she runs to him right away and greets him with a "hi Kuya!" in all the enthusiasm a 2 yo can give. they fight with each other all the time...normal and annoying. She's a yeller, the first to strike a slap, the first to throw a tantrum while he's the first to tease her with a toy and take it away when she shows any interest. Fights aside, she really does love him and reaches out to hug him when she's hurt or sad, asks him for kisses and help, asks him to carry her and boost her up, and the genuine glee from their laughs when they get along is truly heartwarming. If I die tomorrow, in my heart of hearts they will be there for each other even at a young age! Speaking of toys though, her recent favourite is the Duktig kitchen from IKEA and just the general idea of cooking and washing hands/dishes (definitely gets it from me)! at 2, Mikkel is speaking in sentences that I don't recall Max ever doing (maybe i forgot?). Im constantly amazed at how smart she is and I tell her constantly (good try! you did it! you're so smart! wow! good job!). I'm not sure if she understands the concept of numbers, but i've heard her count 1-10, count objects 1-2-3, recite the alphabet in no particular order after G, sing various words in sync while watching Beauty and the Beast, as well as sing various nursery rhymes/songs -- the fave now is the Family Finger song (google if you dare!). she's definitely learning a lot of words from Max- good and bad, and at this point, one just has to accept (i.e.. BUM BUM, BUM HOLE) them and teach appropriate times when it can be used (still work in progress for the near 6yo though)! at 2, she is able to go down at night by herself after a small breastfeed which now seems more like a nibble and snack than a full gulping meal. She will 100% ask for the breast after waking just before or after breakfast, and at night time. Any time in-between it's 50-50 whether she will ask, or I will offer to wind her down. She still loves "Bressy" though. She sleeps from about 830pm-1130pm by herself and when she wakes up crying, Gene picks her up and they co-sleep together. For naps, I haven't really tried anything but the carrier (100% insta-sleep) and Gene has his own routine with her that involves "nyum-nyum time"- only works with him, not me though. at 2, she's 20something pounds. size 2T in clothes, and just under Max's height when he was two years old. I love her so much and she fits perfectly in my arms; just how I remember when I registered her for the first time mentally, physical, emotionally on that 1st day of September 2015. I can't believe it! My love is 2!! I can't imagine my life/our family without her.